Once upon a time, before the emperor tromped the streets of his kingdom in his new clothes, before the ugly duckling first waddled into the sunlight, and before the little mermaid sighed and turned into sea foam, a lad named Hans Christian Andersen penned his very first story – The Tallow Candle. But how was it discovered? Let’s go back to the future to see it unfold. On October 2012 on the island of Funen, the same island where our esteemed author was born, a historian by the name of Esben Brage unearthed the manuscript from the bottom of an archive box. Two months after the discovery, historians confirmed that the handwriting was unmistakably Andersen’s, and since the document was written in the mid-1820s, this would date all the way back to the author’s late teenage years. The storyteller was a bright-eyed youth himself when he developed a deep love for stories, and penned one himself. Who exactly was this Madam Bunkeflod? She would prove to play one of the most important roles in the young Andersen’s life. A vicar’s wife, she stayed in a cottage right across the author’s childhood home. 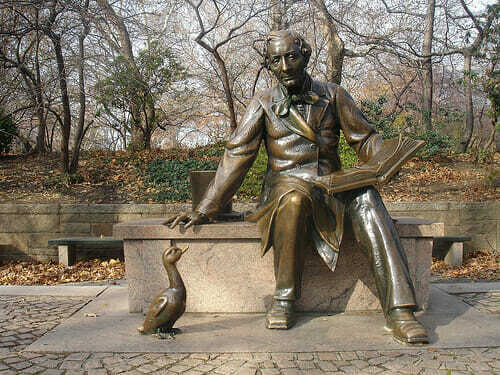 Young Andersen would every now and then visit the lady’s home to borrow books from her, historians agree. The story was a tender thank-you gift from this budding writer to a woman who had played an important role in his life in opening the wonders of stories to him.